Spectacular…a performance of champions, this afternoon was a must win game against Macassar,the tension was high as Macassar are a team not to be taken lightly just because of league position. The first half seemed to drag as we struggled to gain momentum against the visitors, once we settles we were able to muster four tries in the first half with Macky spot on with his goal kicking as he has been all season, slotting 9 conversions and a penalty. Half time saw us just over 20 points up. The second half had an explosive start and was the turning point of the match and the beginning of a try fest, with Eddie leading as a true Captain, running in 3 tries, Chris and Hillroy both adding 2 more tries, Michael, Shane and Jakes each adding a try a piece. The ball seemed to move wide quickly allowing us to beat the opposition on the outside when not overpowering them with the forwards, the guys definitely seemed driven today. Today was a great day at the office! 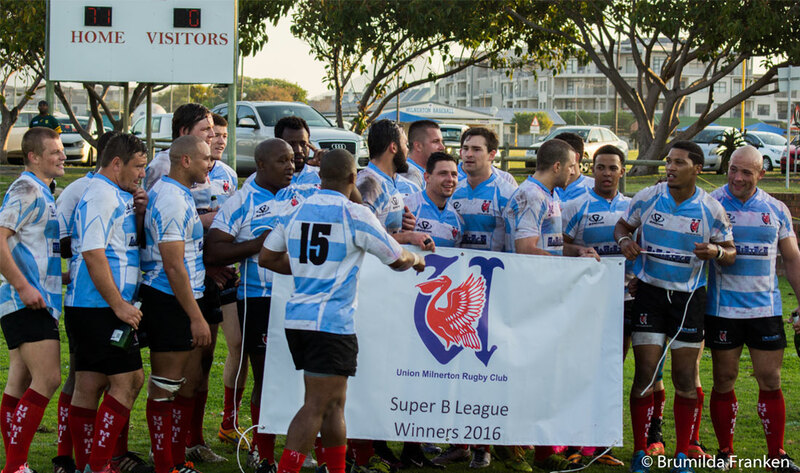 Our victory saw us crowned Super B league Title Holders. Congratulations to our 1 st Team coaching outfit, you guys did a stellar job, here’s to next season.